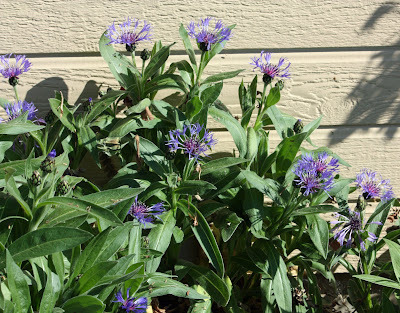 Boise Daily Photo Garden Shot: Flowers...or Weeds? How about "flower weeds?" These persistent buggers have been in our yard since we moved in. They pop up mostly in the strawberry patch. I believe they're a type of bachelor's button. At least they're pretty. Can't resist. I am such a busybody. I paint in watercolors and am always looking for well focused flower photos to paint. I was collecting Cornflowers the other night and I can tell you that these are they...er, I think that ws grammatical. These are apparently a wild variety. I am a gardener myself and love to see other peoples proud moments.